Chalk one up for the feisty local tabloid. When Fox 25 anchor Maria Stephanos announced yesterday she was leaving the station after almost 20 years, she kept the details pretty skimpy (via TVSpy). And today’s Boston Globe Names column kept it that way. Crosstown at the Boston Herald, though, Jessica Heslam had a lot more to offer. 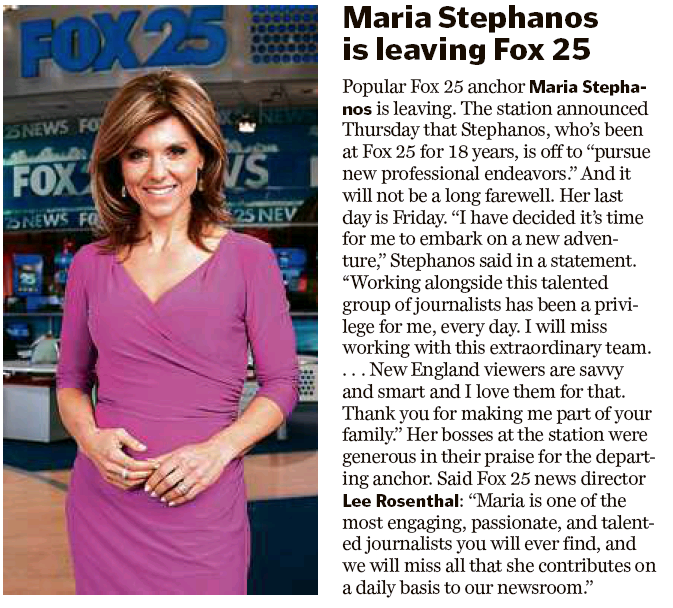 Boston’s TV news scene was blindsided by the shocking announcement that Fox 25 powerhouse anchor Maria Steph­anos is leaving after nearly two decades — just 11 months after the station’s new owner came to town. The new owners want shorter stories and more of them. They also want to boost the number of stories in communities with the highest number of meters that track TV ratings, sources said. Okay. Now it’s making some sense. Although we’re sure there’s more to come. Check both dailies for details. This entry was posted on Friday, September 11th, 2015 at 12:42 pm and is filed under Uncategorized. You can follow any responses to this entry through the RSS 2.0 feed. You can leave a response, or trackback from your own site.